The wheels of the Turkish Airlines flight from Istanbul touched down around 4 a.m. at the Tehran Imam Khomeini International Airport. 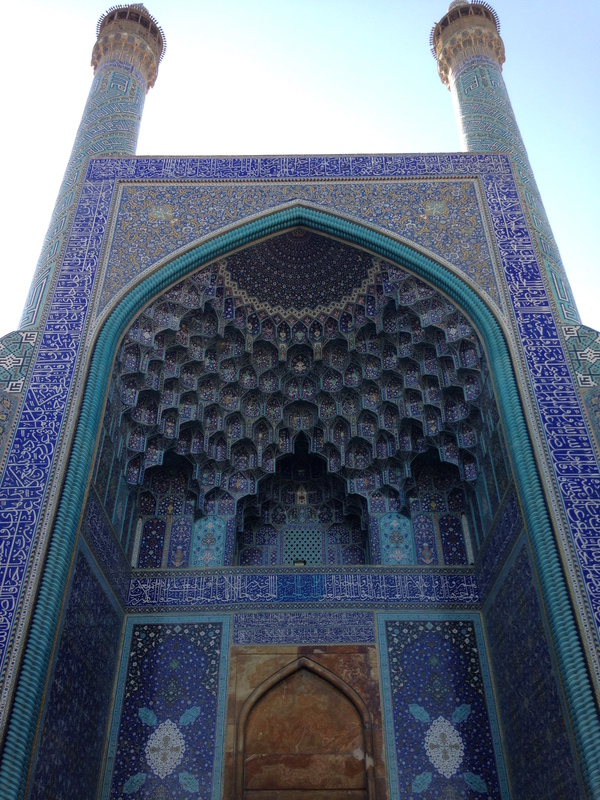 The car ride from the airport to Isfahan, the ancient capital of the great Safavid dynasty and in its time one of the largest cities in the world, took about four hours. Along the way, driving on the modern highway, the ancient history of this mystical land starts to unfold. Well-preserved remains of remarkable centuries-old houses, carriages, and water wells, scattered on both sides of the highway once belonged to the famous "Silk Road" used by traders and merchants on their travels from China and India to the Mediterranean Sea. Not only silk traveled these distances in ancient times, but spices, crafts, technology, cultures, religions -- in short, the whole of civilization. Rocks dominate the landscape. Mountains lying not too far from the road, resonating powerfully with various nuances of brownstone with shapes and forms that are just breathtaking. Everything blends in harmony. The might of old is present all around. 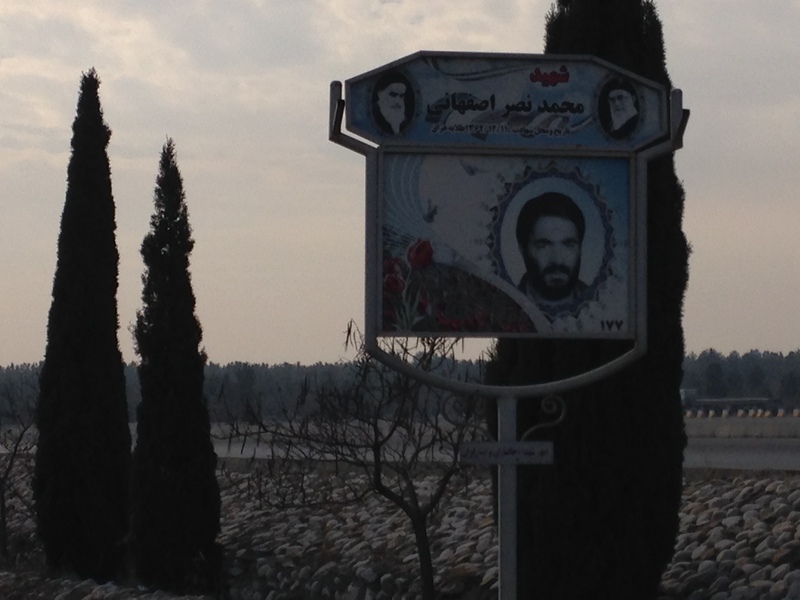 Throughout the road, passing by villages and small towns, road signs are placed, with pictures and names of fallen soldiers, Shahids, from the Iran - Iraq war. And there are quite a few of them. 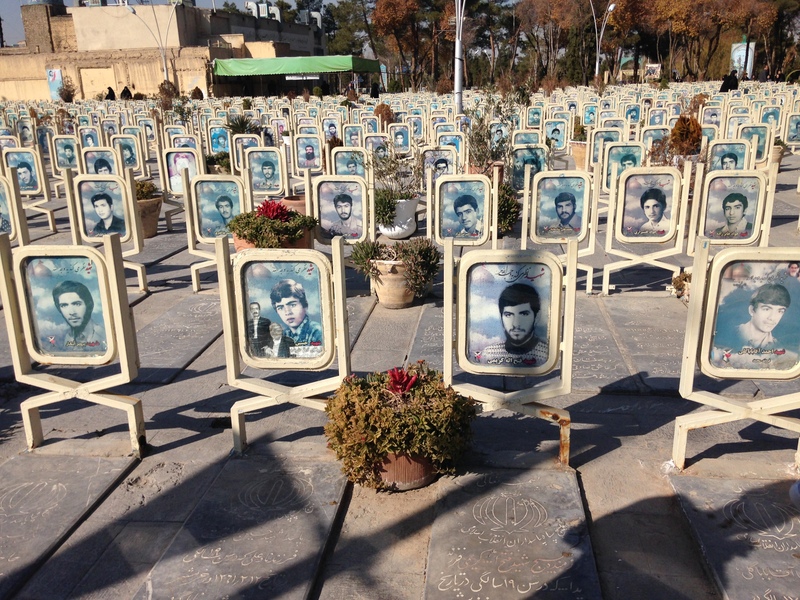 Each city in Iran honors their fallen loved ones by placing plaques with their faces and names along the road, so they will never be forgotten. 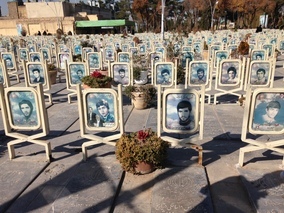 Iranians are very sensitive and respectful to all of their people that died in the eight-year war with Iraq that began soon after the Islamic Revolution in 1979. In December last year, in Tehran, a memorial commemorating Jewish Iranians that died in the war with Iraq was raised in their honor as well. The surprise Iraqi attack on Iran came on September of 1980, aimed by Saddam Hussein to position himself as the "ruler of the Arab world" out of fear that the long-suppressed Shia majority in Iraq could be inspired by the Islamic Revolution in Iran to rise up against him and Iraq's ruling Sunni minority. Half a million Iraqi and Iranian soldiers died, and more than half a million civilians died, with many more injured. Saddam Hussein used chemical weapons killing either from direct death, illnesses or injuries, over 150,000 Iranian civilians. Iran's Ayatollah Ruhollah Khomeini banned development and use of chemical weapons to retaliate against Iraqi chemical attacks. His position on this matter was firm even after June 1987, when Iraqi aircraft bombed the Kurdish city of Sardasht's residential areas exposing over 8,000 people to mustard gas. He was explicit that such weapons are against Islamic principles. The scars of the war are still present and felt everywhere. I walked through the graves at the Shahid graveyard in the Takhte Fullad area of Isfahan. Old and young, some as young as fourteen. They were not soldiers, I was told, but ordinary boys and men from Isfahan who took up arms to fight the Iraqi army. Family members sat quietly next to the tombs of their beloved ones. Next to the cemetery, a beautiful ceramic board reads: "This grave belongs to Hazrate Yusha Naby; One of the pioneers and masters of Bany Israel." As I walked to the tomb of the Jewish Prophet Yusha Naby, buried here, a young boy came to me offering dates. Soon after, another one, and another one came by to all of us approaching the Prophet's tomb. Here, it is a custom to offer dates, so that a person can offer them to God. 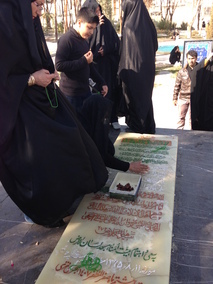 A box of dates is also placed on the Prophet's tomb, for people coming there to pray, to eat them, and make their offerings. Iranians are a very patriotic people. In the end, allegiance to their country, standing up for so many centuries, matters more than ethnic or religious background. 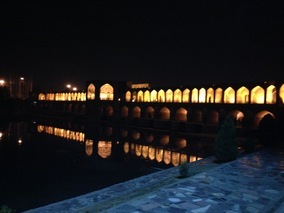 Isfahan, a UNESCO-designated World Heritage Site, was first mentioned in 2700-1600 BCE during the Elamite civilization but reached its peak in the 16th century under the Safavid dynasty. The city is known for its priceless treasures: Si-o-She-Pol (The Bridge of 33 Arches) Joui, Khaju and Marnan bridges; the Agha Nour, a 16th century mosque, among another 12 mosques built from the 16th to 19th century; the Palace of Forty Columns, built in 1647, the Palace of Eight Paradises, built in 1669, the Royal Palace from the early 17th century, and others; a number of synagogues and churches; the stunning Naqsh-e-Jahan Square, built in 1602, and many others. It is due to the richness of its history that Isfahan is also called the "City of Half of the World" (Esfahān nesf-e jahān ast). Modern Isfahan is also home to one of the world's largest steel production plant facilities, along with a major oil refinery and airbase and aircraft manufacturing plant. 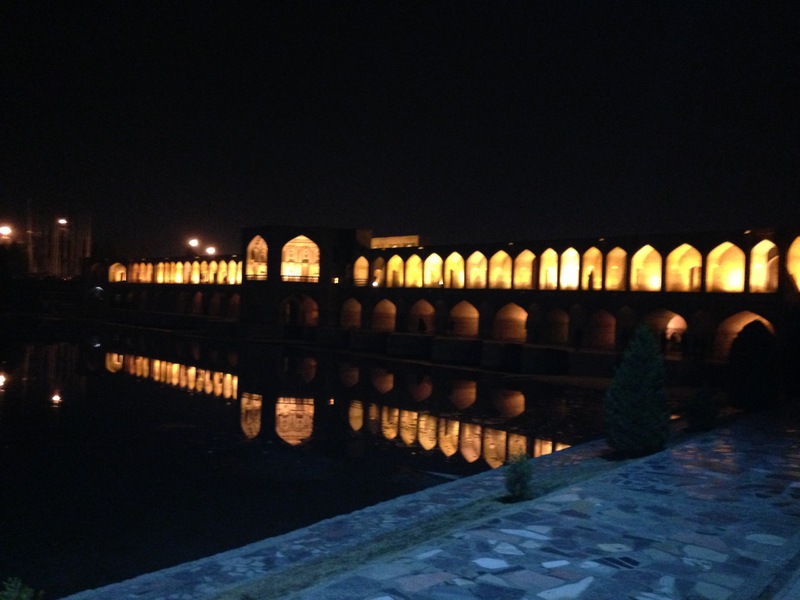 Taking a journey through centuries of history in today's Isfahan, you will encounter extremely warm people. Iranian hospitality is phenomenal. From the reception desk at the Abbasi hotel, built by the Sultan Husayn of Safavid some 300 years ago - the oldest functional hotel in the world -- to tour guides, salesmen in the famous bazaar -- everybody greets you with warmth. "Oh, you are coming from America. Welcome, welcome!" is what I was told over and over again. In the shop where I purchased souvenirs, the owner was so happy to have a customer from the U.S. that he offered me tea, cookies and sweets, eager to chat while his staff was wrapping the goods I had purchased. They made sure to do it slowly, so I could have time to experience these local delicacies with tranquility and have time to chat with their boss. "We love America and I hope we will be friends again. Please tell this to your friends when you go back," he said. In honor of the new friendships I made in Iran, I just did. And it is to be continued.